This month in our Artist Interview Series, we’re featuring paper flower artist Susan Bonn from Susan Bonn Designs. If you’re not following her on Instagram, you should! Susan Bonn is one of our annual members and a member of our Paper Flower Circle group. 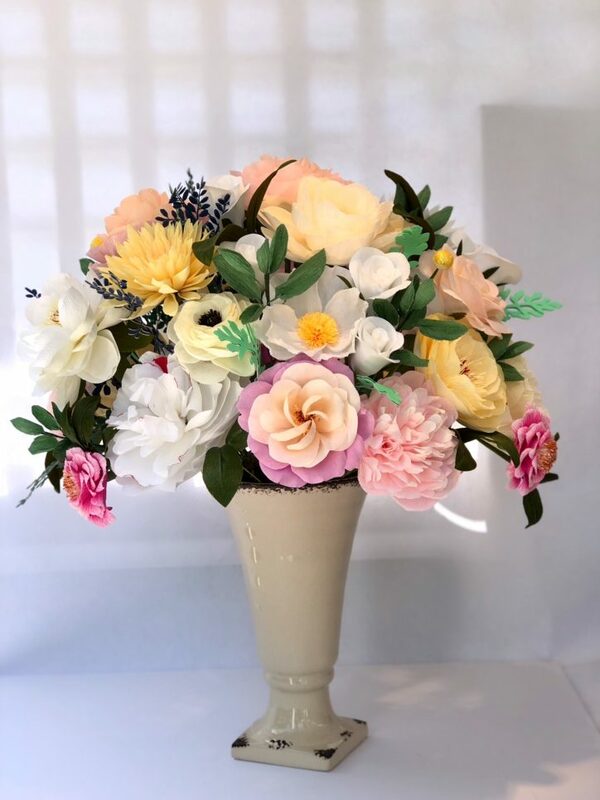 She also makes beautiful paper flowers for weddings, baby showers, and other events. After 40 years in the financial services industry, Susan recently retired as a financial advisor. We think her story is amazing. What started out as a creative hobby on the side is now what she does for a living! It’s also what led her to new experiences and new friends. 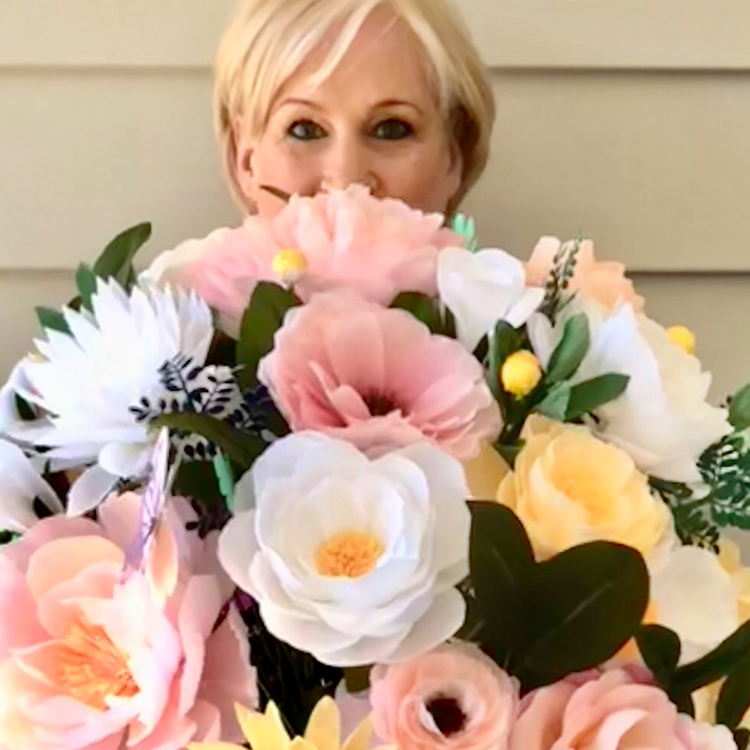 In this Q&A, Susan Bonn shares how her very first DIY paper flower went, where her inspiration comes from, and a few tips for making paper flowers. Lia Griffith (LG): Where did you learn to make paper flowers? Susan Bonn (SB): I was wandering around the Internet and came across some incredible paper florists. I knew right away I wanted to make beautiful paper flowers. I’ve also spent a lot of time on your site! LG: What do you love most about making paper flowers? LG: What’s your greatest challenge when making paper flowers? SB: Deciding where to start on a project. Luckily I have orders for my work on a regular basis, so getting started is pretty laid out. But there’s always “which blooms do I want to start with”, or “do I want to do the foliage?” It’s a dilemma. LG: Tell me about the first paper flowers you made. What were they like? SB: OMG, IT WAS HORRIBLE!! I made a magenta-colored ranunculus following your video tutorial. I thought that crepe paper wasn’t my forte, so I switched to text weight paper. In fact, I used your tutorials to make a huge Thanksgiving arrangement for my mantel. I remember I emailed you several times to get advice about it, and you were so kind to respond. Eventually, I wanted to give crepe a try again…and the rest is history! I dove into crepe paper headfirst and it was sheer bliss. I keep that ranunculus in my studio to remind me how far I’ve come. LG: Where does your design inspiration come from? 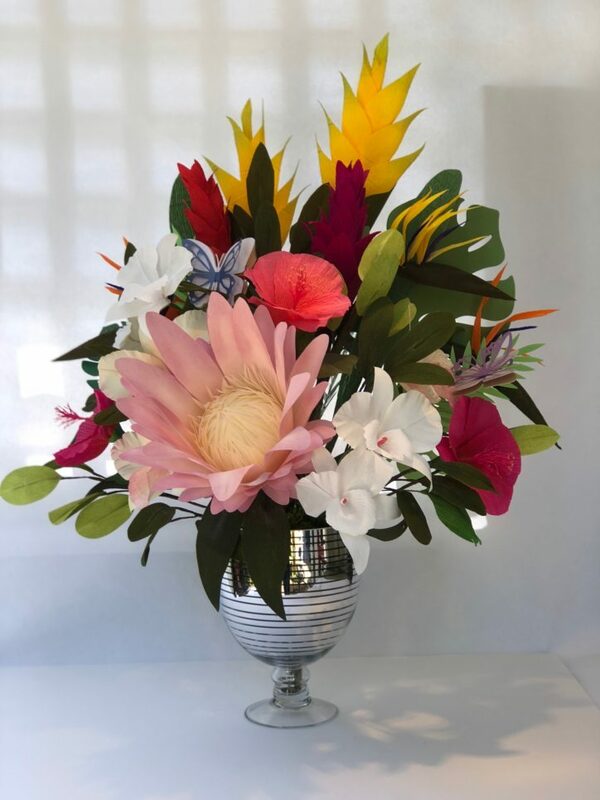 How do you develop a flower design? SB: I get most of my inspiration from nature. I was recently on vacation. And there were these beautiful water lilies in the canals where we kayaked between some lakes. They were beautiful, so I picked one. We took pictures of it immediately and when I returned to the lake house, I dissected it to save the images and make my own lily at a later date. Our Instagram and Facebook community does dissections all the time, and so they are useful when you’re attempting to make a flower botanically correct. 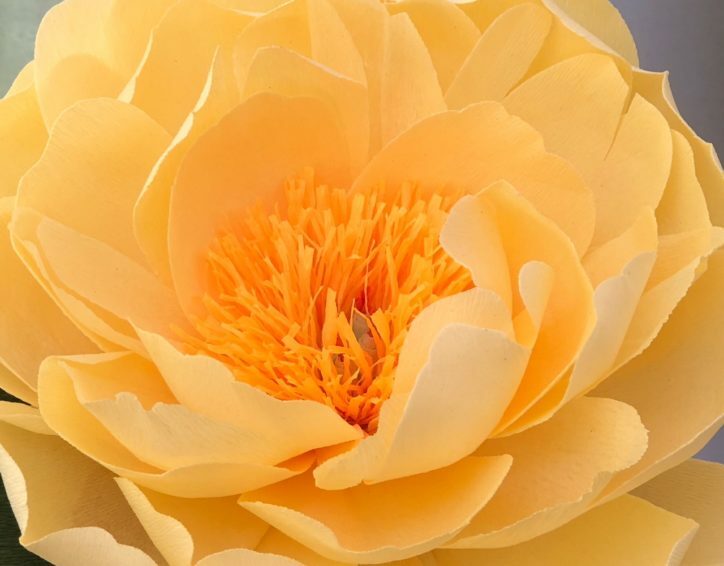 When working on a new bloom, I usually google images of the flower. But the best way is to take a bloom apart and see how Mother Nature put it together. LG: What kind of paper do you love to use? SB: You know the answer to that!! I’m loving your papers. The extra fine crepe paper is a delight to work with. And with no machine lines on the heavy crepe, it’s so efficient to use. There’s less waste—I’m all for that. And the stretch on both the fine and heavy crepe is really great. I do get paper from other sources, but only when I’m looking for colors that aren’t in the floral colors that you have. 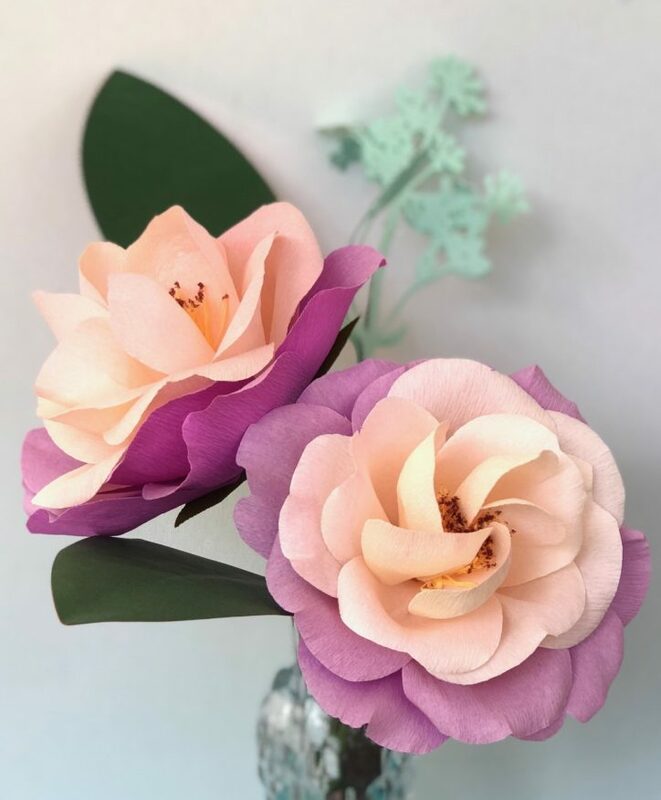 LG: What are your go-to tools when it comes to making paper flowers? SB: My fine detail hot glue gun!! It’s not low-temp, but I just can’t part with it. I always have a spare on hand—just in case. I love my scissors, too. Scissors really make a difference. LG: Do you have a top tip you could share for making paper flowers? SB: Don’t worry about templates! I don’t use them often—unless it’s a complicated petal or leaf. I got really held up in the beginning because I was always looking for templates. Finally, I realized that the templates weren’t going to make my blooms a success—practice was. I do look at templates from time to time, but mostly for reference. Just start cutting! Paper is cheap compared to lots of other craft projects I’ve done. LG: What advice would you give to someone wanting to make paper flowers? SB: Practice, practice, practice. It took me a few years to finally put out a dahlia I was truly happy with. In addition, I would recommend checking out some Facebook groups, Pinterest, and Instagram. There are lots of accomplished artists who are more than willing to help. LG: Thanks for sharing with us! 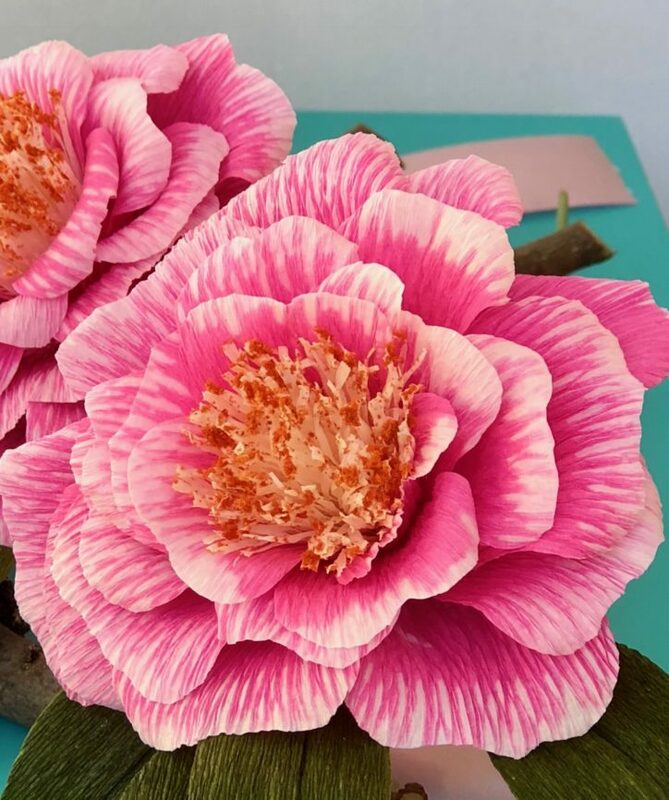 To see more of Susan Bonn’s paper flowers, make sure to check out her Instagram page. And if you’re a member who would love to be featured on our site, we want to hear from you! I have just started making paper flowers. My first an aqua peony, quite pleased with my first attempt. I have ordered a pack of your extrafine crepe paper, can’t wait for it to arrive. That’s great, we hope you love it as much as we do! !